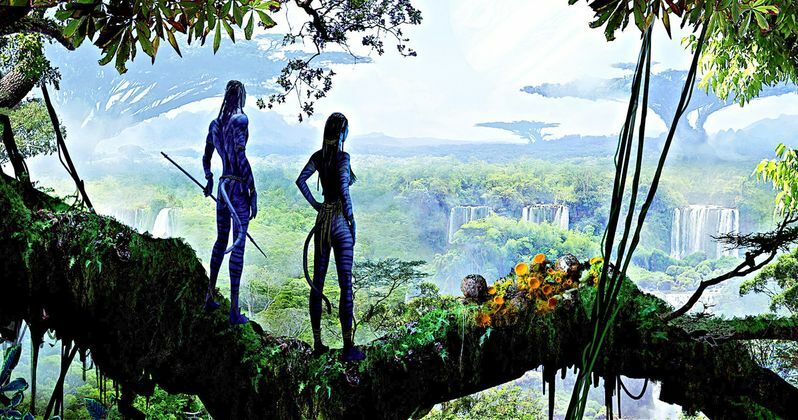 James Cameron is deep into production on Avatar 2, as well as his three additional sequels that are being planned. Even though he's been shooting for the better part of a year, the studio and creative team have kept a pretty tight lid on things. Cameron clearly has some surprises in store for us. However, producer Jon Landau has just revealed several interesting tidbits for us to chew on. First off, he explains that the Na'vi, who the first movie centered on, only inhabit a small section of the planet Pandora. The sequels are going to explore other valleys on the planet and introduce us to new groups and species. Here's what he had to say about it. "We're going to go to totally different environments, we're going to meet different cultures. Just like our planet is as diverse culturally as we are environmentally. We want to introduce people to different cultures. In the first movie, we only met the Omaticaya clan, and they are the clan here allowing us to come to the Valley of Mo'ara. But as we venture out we're going to different environments and different clans." Jon Landau made these reveals during a lengthy interview that mostly focuses on the Disney theme park attraction, Pandora: The World of Avatar. Speaking of Pandora, the producer also made it clear that, despite the fact we have four more of these movies to get through, they are all going to take place on the same planet. This isn't going to become a galaxy sprawling adventure. "As we've moved on with the sequels to Avatar we made a very conscious decision to stage the whole four sequels on Pandora. We don't need to go to another world if we want water, we're going to go to the oceans of Pandora." James Cameron has previously made it clear that much of Avatar 2 is going to take place underwater. Part of what took so long to get the movie going was getting the technology ready that is needed to do so much underwater filming. One last thing that Jon Landau offered up also relates to Pandora: The World of Avatar. As he teases, some of the new creatures that were introduced on the Flight of Passage ride may show up in the sequels. "Also, some of those creatures that you see [on Flight of Passage], don't be surprised if they show up in the films." Avatar remains the highest-grossing movie ever released with a take of $2.78 billion worldwide. Even though it will be more than a decade between sequels by the time Avatar 2 hits theaters on December 18, 2020, there is reason to believe there is a lot of money to be made. With the Disney purchase of Fox looming and the future sequels likely to be controlled by the Mouse House, crossover with the theme park attractions makes a ton of sense. This news comes to us courtesy of Inside The Magic.